Having rejected the idea of carrying the spare wheel on the back of the van as it would base involved removing sonic of the kitchen units to strengthen the end wall I set about making a carrier which would fit on the drawbar. The first job was to remove the gas bottles and carrier and reposition them in a bedding locker. This incidentally involved making a small well for the bottles to drop into, but was worth the trouble as no longer have to worry about loss of gas pressure during very cold weather. Also it is no trouble to turn the gas off at night from inside the caravan. 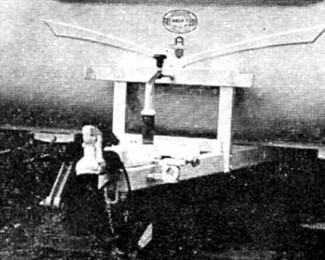 The construction of the carrier is simply four pieces of suitably placed 2in angle iron bolted to the V of the chassis. 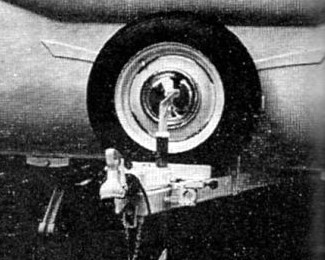 The apron was cut out between the two bottom angle irons to allow the spare wheel to drop down a couple of inches between the V.
An additional piece of 2 ½ in angle was fixed to form the top member, the ends of which were extended enough to allow them to be bent around the tread of the tyre. Fixing the spare wheel involves nothing more than a ½ in diameter bolt fixed to the top member and long enough to protrude through the centre of the wheel. A suitable cramping plate and ½ in nut and washer complete the fixing. A hub cap finishes the job off but is not essential, Hardly any of the carrier can be seen when the spare wheel Is in position and the front of the van does not look as cluttered as when the gas bottles where there. 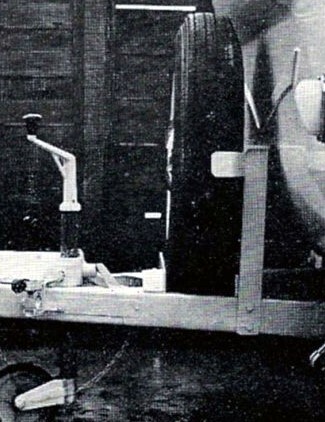 One possible disadvantage of positioning a spare wheel on the drawbar is the increase in noseweight. However this could be reduced by making the carrier in an aluminium alloy angle. And in any case moving the gas cylinders back offsets a lot of the increase. These images show the simple angle iron construction for the spare wheel carrier on David Field's Castleton. The idea is adaptable to virtually any make of caravan.